Wildflower Wax Candle Studio: The ultimate wedding gift? Dave and I went to a fantastic wedding shower this weekend at Magnolia Manor in Helena. Jean the beautiful bride to be...tall...platinum blonde hair... who I have to say looks like a Hollywood movie star with southern charm all wrapped up into one. Two words, Love Her!!! She requested one of Dave's paintings as a wedding gift and this is what she got. I loved it so much, I have to admit I didn't want to part with it! I don't think some of the ladies over 60 knew how to react or what to say! It's kind of a girl thing so her husband will probably want to put it in a closet. So excited to announce that pretty soon they WILL be in the CLOSET on the t-shirt designs we are making out of Dave's designs, which you can get right here at Wildflower Wax! oooooo! I cannot wait! I am so going to get one! Oh, so hope you get them in a big girl size t. I so want one! How long???? and please order at least one size XL for me! I will order some big! LoL! However, you all don't need big! There supposed to fit tight anyway! I will need an XL too. Hold me one ok? Chest. enough said. Very irritating. OK...are they in yet? SOOOooo want one! 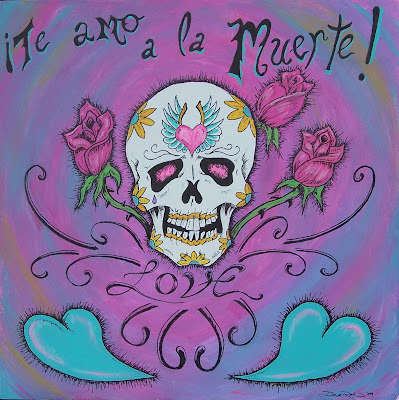 ¡Te amo hasta la muerte!